Jamal C. Morris was struck by a hit-and-run driver while riding his bicycle in West Philadelphia on April 17. The Drexel graduate and engineer died in the hospital just a couple days later. Police have still not found the person who killed him. Since that time, the Bicycle Coalition has been meeting with, and working with, Morris’ family and friends to make Philadelphia’s streets safe. 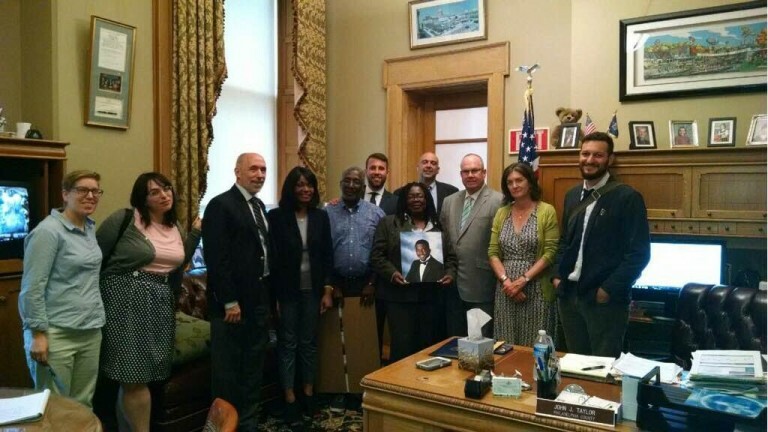 On Wednesday, members of the Bicycle Coalition of Greater Philadelphia, Neighborhood Bike Works, the Morris Family, and friends, visited the State Capitol where we met with members of the Philadelphia delegation to advocate for safer streets. 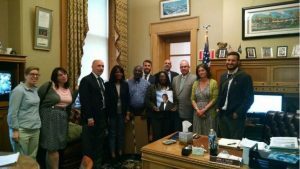 This was our second trip to the Capitol to advocate for safer streets since Channabel Morris contacted the Bicycle Coalition. Senate Bill 1267: Extend Red Light Camera Program to 2027. Pennsylvania’s red light camera program is set to expire next year. This bill would extend it. Senate Bill 1034: Photo Enforcement Program on Roosevelt Boulevard. This bill would create a pilot program to reduce speeding on Roosevelt Boulevard. Speeding currently accounts for a third of all traffic deaths in Pennsylvania and Philadelphia. Senate Bill 535 and 559: Authorize Municipal Police to Use Radar. This bill would allow local police departments throughout Pennsylvania to use radar to catch drivers for speed. Pennsylvania is the only state in the country that does not give local police this World War II-era technology. Our group, alongside State Rep. John Taylor, who has been advocating for red light cameras for a decade. Channabel Latham-Morris, Jamal’s mother, was incredibly strong while speaking to the senators with whom we had meetings. Legislators Larry Farnese, John Sabatina, John Taylor and Art Haywood all graciously met with our group (or had staff meet with our group) and pledged their support of these bills. 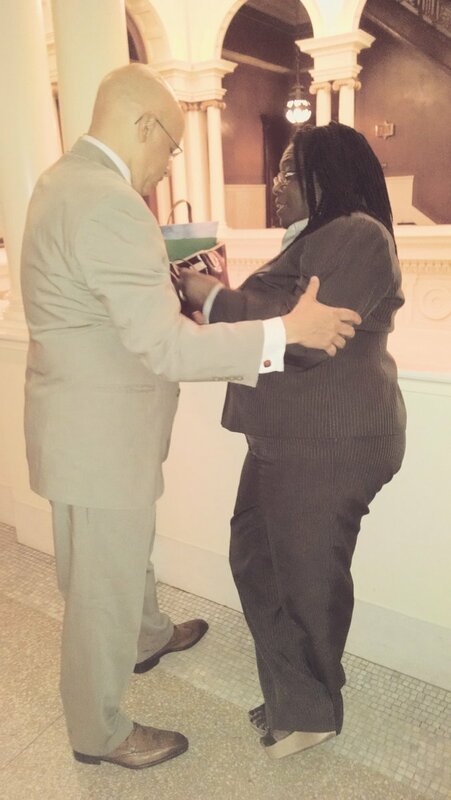 Although Sen. Vincent Hughes did not have time for an official meeting, he was able to meet with Morris in the Capitol Building’s main lobby. Jamal’s hit-and-run crash took place in Hughes’ district. On a previous trip, we met with Republican Senate Leadership from all over the state, asking them to advance these pieces of legislation for Philadelphia. So, there’s been a lot of work leading up to this. Now, we just need these bills to come up for a vote. That’s where you can come in. Since our trip yesterday, the National Motorists Association has already contacted the state Senate with a fact-free message to note red light cameras do not work. Think you can help out? It just takes a few seconds to use our tool and send an email to State Senate Leadership to make your opinion known on these issues. Email campaigns work — and the lawmakers in the Capitol should know how much support exists for these measures. Jamal’s friends are additionally holding a fundraiser on Saturday to support the charity his family has set up in his name. All information and RSVP is here.